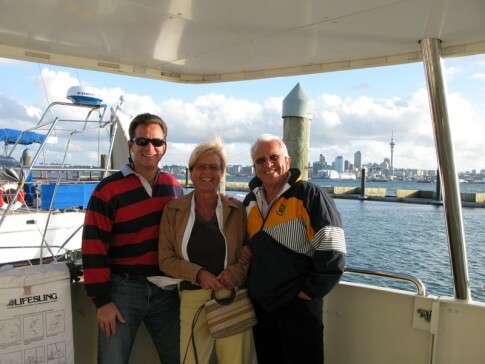 Returning to New Zealand is the closest thing to coming home. We have said it before, and we'll say it again, we love it here. The moment we stepped off the plane, retrieved our long lost luggage, and embraced our dear friend from m/v Karma, we lowered our shoulders, relaxed our jaws and settled in to Ataroa. Laughter was abundant while dining at Portofino in Devonport, an Italian restaurant run by a group of Yugoslavians, as Richard and Krista spoke their native language over carbonara and veal marsala. The bond of friendship amongst sailors, specifically cruisers, I can't talk about the global racers, is something that runs really deep. Maybe it's the weather we suffer through together, the language barriers, the little villages we navigate, whatever it is, it feels like family whenever we are together. Mushy? Yes. Reality? Yes. After a very nice sleepover on Karma, a nice spacious powerboat, we hopped a bus to Whangarei about 3 hours north of Auckland. Again, we had huge, long, tight hugs awaiting us at the bus stop by Julie and Geoff from s/v Flashback. These guys actually rejigged their touring schedule to overlap with us. How great are they? About a month ago, they flew to NZ and left Flashback at a marina in Fiji. Within minutes, we drove to s/v Dosia to find Margie and Drew, one of our favorite couples afloat. 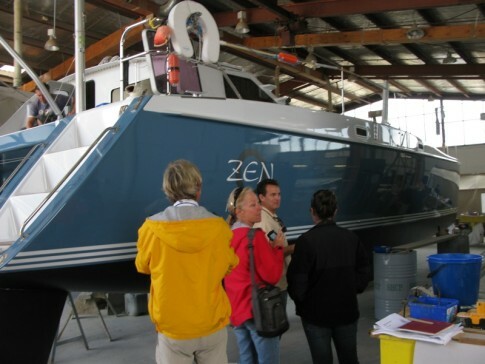 Although they are fast approaching their time to deliver their newly sold boat to Australia, they played hooky and escorted us to Friendship Yachts to see our initial reaction to Zen's new hull color. "Stars and Stripes Blue" was exactly what we had hoped for. The color was perfect! Tom describes Zen as 90% done, but the last 10% is the hardest to wrap up. That sums it up. Today, all our buddies left Whangarei via airplane or boat, sadly leaving us to zero in on our unfinished boat projects. Every morning, we depart our hotel and drive our rental car into the boat yard, to the long list of "must do's". If my sinus infection miraculously went away, this private time with my hubby would be even more enjoyable, but it lingers. And, I tried to convince myself this month away from our kids, who opted to stay with our best buddies in PA, would be a 2nd honeymoon. It's very hard to adapt to life away from my kiddos. Two years of being within 50 feet of one another was something so special, unique and precious, it's hard to be a hemisphere away. Until we reunite in Florida, I'll praise Skype and email which keep us connected to Cammi and Cole. Meanwhile, everyone in friendly, familiar and warm Whangarei keep asking us where our children are. It's nice to know they fondly remember our appendages. Who can I nurture this month? My new friend, a cuddly, excited, hyperactive 11-week old fox terrier puppy named Godzilla, who lives at the boat yard...that's who! No photos of Godzilla, but new albums and photos are posted...take a peek.